On Fantastic Planet Noveller's Sara Lipstate spends the early parts of the record selling us on her potential, making us rethink how we hear and feel texture in music, how we understand musical structures. Austin-based Sarah Lipstate's musical project, Noveller, began as an electric guitar project. Lipstate, however, has spent time doing far more than just playing the guitar. Lipstate is also a filmmaker. She's improvised with the likes of Carla Bozuluch and Lee Ranaldo. She's played as a member of Cold Cave and Parts & Labor, among other bands. In other words, she's covered a lot of musical ground. That eclectic and wandering background informs her latest Noveller record, Fantastic Planet. Though still built around the guitar, this album pushes into lush textures and curious juxtapositions, creating expanses that dig into post-rock traditions as well as cinematic soundtracks. Fantastic Planet, in ambition and grandeur, earns its title. Opener "Into the Dunes" immediately immerses the listener in the album's subtle charms. It slowly blooms to life, as faint guitar humming opens up a space into which rolling notes can echo. There's a nighttime desert feel to the track at first, full of dark stillness. As keys start to stretch that shadows the guitar leaves, percussion and grinding distortion rumble in. The song starts to quake, but its foundation isn't shaken, just shuffled around. The space from the beginning fills with sound, with sinister precision. It's not a song that builds to a crescendo or breaking point so much as it compounds over and over again, swelling with no signs of stopping. It isn't until the final notes buzz that the song relents, turning things over to the softer tones of "No Unholy Mountain". This track maintains the restraint at the start of "Into the Dunes". Keyboards and guitars mix with treated atmospherics to make a dream-like layer of sounds, one that owes as much to the airiness of Stars of the Lid as it does to the playful tones of the Badlands soundtrack. These two tracks show a musician both in control and willing to push boundaries. "Into the Dreams" surprises because, for all its building squall, it always feels under Lipstate's control. Despite its lightness, "No Unholy Mountain" maintains tension because Lipstate never lets the tones thin out or drift too far. "Rubicon" doubles down on the strengths of both of these tracks. Plinking keyboards roll through the song, almost day-glo in their brightness, until grinding, teeth-gritting guitar fills upset the balance. They seem to stretch to snapping, breaking the control of the previous tracks in another interesting turn, one towards chaos. After these impressive opening salvos, the rest of the album maintains these elements but sometimes has trouble maintaining the same amount of surprise. "Concrete Dreams" has all the bleary-eyed atmosphere, but never finds its own depth to make it fully resonate. "Pulse Point", meanwhile, way overplays its hand, turning the chaos of "Rubicon" into an excess of layers that grates more than it intrigues. "The Ascent", meanwhile, recaptures the magic late in the record by returning to the negative space that so shaped "Into the Dunes". Here, you can feel a landscape opening up. The music, with its warm tones and fragile phrasings building to towering rundowns, feels almost topographical. You can feel every peak and valley. 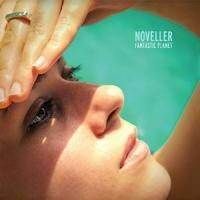 As a whole, Fantastic Planet is a solid outing for Noveller. It suggests some serious talent and charm, and Lipstate spends the early parts of the record selling us on her potential, making us rethink how we hear and feel texture in music, how we understand musical structures. With all that early potential, the rest of the album sometimes can't keep up. The record, though, never loses its way, remaining a convincing and mysterious sonic space throughout, one often worth getting lost in.